Chinese authorities have launched an investigation into a vaccination scandal that is sending shockwaves through the country. There is no indication anyone has been harmed by the vaccines, but the widening scandal has frightened people. It has also brought renewed criticism of the government after a string of food and drug safety scandals over the past decade. Last week, the China Food and Drug Administration said Changsheng Bio-Technology Co. (002680:CH) was fined for having produced and sold low-quality vaccines for infants, as well as found to have fabricated production and inspection data on a rabies vaccine for use in infants. The regulator also identified other problems with processes and equipment. 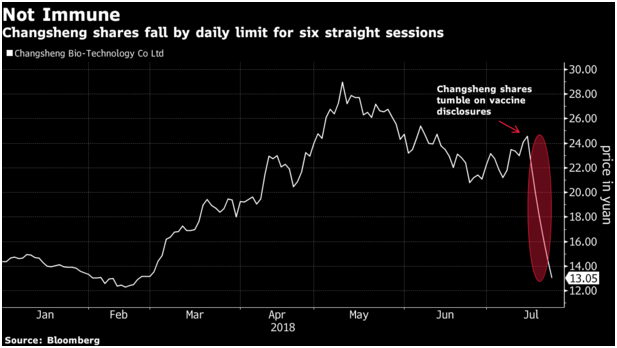 Shares in the company plunged 10% today (its daily limit) in Shenzen for the seventh session in a row. Currently the stock is trading at CNY¥11.75, down 109% since the scandal started. The scandal has hit other listed drug makers all falling by the daily limit. The CSI 300 health care index is down 4.1%; the biggest lost since May 2018. While the government has vowed to investigate, the incident is likely to fuel further concern about fake or poor-quality food, health products and other vaccines available in China. Product safety is still a key issue in the country where consumers still remember when China’s manufacturing industry was rocked by a series of safety recalls a decade ago. Infant milk powder was laced with melamine, toothpaste contained formaldehyde, while children’s toys were painted with excessive levels of lead. Even exported pet food had contaminated gluten that sickened thousands of cats and dogs that ingested it. Chinese consumers have taken to social media and criticised lax legal enforcement by the regulator for this issue and are now concerned about drug safety expressing concern whether people are actually receiving high-quality products. Demand for vaccines in China is on the rise, driven by loosened family planning policies, increasing awareness and an aging population. The country’s 30 billion yuan (US$4.4 billion) vaccine market is expected to double by 2021. The rapid growth of the vaccines market has also been tainted with safety issues as this is not the first time substandard vaccines have been produced and sold nationally. In 2016 consumers were in an uproar when it was discovered some US$88 million worth of vaccines were either found to be inadequately refrigerated or were not transported in approved conditions and expired vaccines had been illegally sold throughout the country. Chinese Premier Li Keqiang call for an industry-wide investigation caused stocks to tumble, with shares of many vaccine companies falling by the daily limit. Shenzhen Kangtai Biological Products Co. (300601:CH), which produces vaccines against hepatitis B and pneumonia, is down 10% again today taking losses to 39.4% since the scandal started. Chongqing Zhifei Biological Products Co. (300122:CH), the marketing partner in China for Merck & Co.’s Gardasil vaccine against the human papilloma virus that can cause cervical cancer has curbed losses to 22.1%. Prior to these events, both companies have seen their share prices jump more than 57% this year on growing demand for vaccines.